A Leading German Online Dating Service. 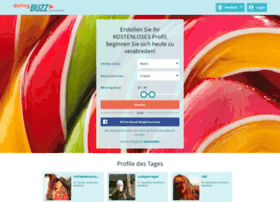 DatingBuzz Deutschland provides a secure, hassle-free environment where people can meet to form new online relationships. Whether you're looking for new friends, a quick soiree in the world of online dating, or the love of your life, you're sure to find someone special amongst our thousands of personal ads. Using DatingBuzz Deutschland is quick, easy, safe and completely anonymous.